Even at the most famous temples there are stones laying around to rebuild walls and the like. I saw this at nearly every temple in Siem Reap. 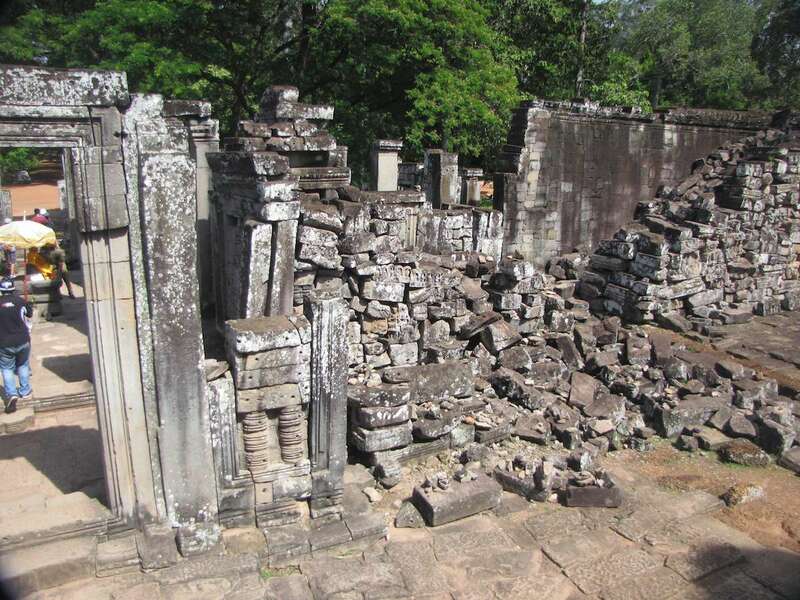 At less famous one, there are whole buildings that are piles of carved stones obviously being collected to rebuild building, walls, archways, etc.. Mostly, I believe, the stones are put back together like puzzle pieces; using the original stones to rebuild. Though I also believe new stones were added where pieces seem to be missing. Related: wide view at Candi Sewu in Indonesia showing stones collected in preparation for rebuilding shrines and temples. Photos copyright John Hunter. Stones to Rebuild Bayon Temple is available for use as creative commons attribution. Only photos noted as available as creative commons attribution may be used without permission (in the manner described only), other photos may not be used without permission.